A week or so ago an anonymous commenter posted on the F&M asking about where s/he could find hematite sand. I had never even heard of the stuff but I had an inkling as to what it might be! 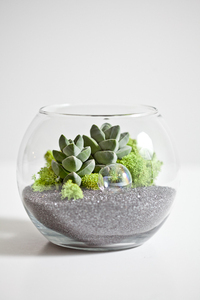 A quick search confirmed my suspicions and produced this lovely terrarium kit from Collage With Nature complete with hematite sand. Beautiful and somehow evocative of retro-futurism to me. Anyone have any experience with hematite sand or other sand derived from semi-precious stones?